Information technology was introduced in clinical laboratories around 30 years ago, although some analytical instruments had already been empowered with microprocessors, or “intelligent systems,” for simple calculations. At that time, not even the most forward-thinking scientists could envisage the speed at which IT would race ahead, evolving from microprocessors embedded in instruments to specifically designed laboratory information systems (LIS). 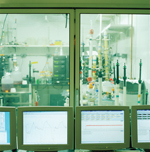 Laboratory instrumentation manufacturers played a critical role in the implementation of IT, creating an unusual market. At the onset, computers were simply attached to analytical instruments to facilitate the flow of data. The main reason for implementing a “laboratory computer” was a high workload. New uses and applications soon appeared, such as transactions from the laboratory to the mainframes of hospital information systems (HIS). What we now know as data warehouses were in fact the result of the natural evolution of information science and technology. Laboratory and institutional computers today contain an incredible amount of data and, surely, knowledge. This flood of information raises a number of questions: Is the computer just a powerful typewriter with a memory, as it seemed 30 years ago? Will natural or artificial intelligence be able to transform data into useful knowledge? Will information technology be able to meet the challenges of the future? Many aspects should be taken into consideration when a laboratory information and management system is under analysis. These include, for example, connections with other laboratory instruments, point-of-care devices, computer platform architectures, languages and standard protocols, robotics, and wireless technology. However, the 2007 symposium debate was centered on the purchasing, dimensioning, and staff training that is necessary before an LIS becomes operative. The large companies have powerful computer facilities and personnel who can participate in efficient software development. Moreover, some of these companies in Spain now have substantial experience in this field. The diagnostic industry’s profound knowledge of the needs and organization of clinical laboratories can positively influence the design of the software products. LIS can be continuously updated and improved as a consequence of commercial pressure to sell reagents or instruments. For many public laboratories with strict budget limitations, purchasing reagents can be the only way to obtain or improve their IT. Clients can feel too tied to a single manufacturer, who appears to be in a dominant position. This may condition negotiations for the purchase of the reagent or instrument. Technical and commercial relations may not be optimal when IT is not the core of the company business. Investment in software development may reduce investment in reagent or instrument improvements. The performance of the systems should fit the individual laboratory requirements. The development, configuration, and/or adaptation of the LIS should be user friendly. Software should be sufficiently flexible to fit the global laboratory organization, allowing communication with other information systems, adapting to future environment changes, and incorporating the possibility to implement new features. Purchasing decisions should be made freely and independently. Ideally, each laboratory should have a specific budget available for IT. Each laboratory’s specific budget was considered the most crucial issue, for if laboratories themselves can manage the acquisition of information systems, a greater number of software development companies would be interested in the clinical laboratory market, and the available options would increase. LIS size depends on multiple technological factors such as the corporate IT system in use. Economic issues such as budget and personnel resources also obviously play a major role, as does the workload of the laboratory. It is a general observation that in recent years, the dimension of HIS has increased in relation to LIS. Before an LIS can be implemented, it is essential to establish an appropriate training plan for users. The aim is not only to guarantee correct operation, but also to attain optimal performance. According to some experts, the use of LIS is frequently less than 40 percent of its potential. However, training should be adapted to the different levels of users’ needs and skills: basic, intermediate, or advanced. The training period is not completed when LIS is implemented, but must be permanently updated through a “continuous education” strategy, such as through meetings with software users from other institutions. Originally, LIS acted as a connection between analytical instruments. As they gained power, LIS progressively became a consistent, permanent communications network among all information systems, including HIS, associated institutions, and practitioners, as well as health authorities. The relationships between health authorities and LIS staff have become considerably stronger through their participation in external quality surveys and exchange of useful epidemiological information. Consequently, for the near future, the essential point is not simply to implement an efficient communication system, but to achieve integration of all information systems. In other words, both LIS and HIS must not be only able to talk each to other, but efficiently work together. In this context, five topics were discussed in depth: electronic clinical records, technology boundaries, changes in cultural paradigms affecting LIS integration, ethical and confidentiality issues, and the introduction of intelligent systems into this scenario. Proper patient identification is essential and patient confidentiality must be ensured at all times. 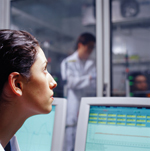 Formal aspects of laboratory data such as nomenclature or units must be standardized. Standard catalogs should substitute corporate repertoires. Ideally, the same repertoire, such as the IUPAC/IFCC, should be used. The information content to be transferred to the clinical workstation should also be standardized, including the presentation of laboratory results in a validated report format. Science and technology have influenced culture and society since time began. In recent years, a new paradigm, the Internet, has produced real, dramatic changes not only in our social life but also in science and technology1 and has almost defeated the client-server paradigm. Today, there is no doubt about the global role the Internet and its many tools play in providing previously unimagined options. A second cultural change we are experiencing is the progressive substitution of competitive systems for cooperative systems. As previously mentioned, the new role devised for the relationship between HIS and LIS, that of sharing instead of competing, may be a general trend. We can, therefore, consider that the conventional clinical workstation is evolving towards a knowledge portal for all participants in the clinical process. The new clinical workstation should act as an intelligent manager integrating all information systems, including LIS and HIS. During this process, however, it is unavoidable that as some problems are solved, other new challenges will appear. In other words, as the amount of communication increases, so do the network knots. Of major concern is the need to clarify privacy issues, access to information, and patient consent, for example. The confidentiality of clinical data is of maximum priority. Moreover, as patients are the owners of their clinical records, including laboratory information, their agreement to manage this information is mandatory. This must be kept foremost in the minds of developers so as to anticipate the eventual use of Internet, SMS (text messaging), or other communication technology, by patients wishing to access their own clinical (and laboratory) data. The conventional clinical workstation is evolving towards a knowledge portal for all participants in the clinical process. The LIS must guarantee that access to sensitive data is limited to persons involved in the clinical process. Safety of sensitive data can be achieved by limiting or registering access to computer files. However, too many passwords or other security procedures for a single consultation, for example, is not only tedious and time consuming but can create negative feelings among healthcare workers. We need to reach a compromise between the patient’s right to privacy and/or confidentiality and the best possible patient care; i.e., a compromise between professional activity, technology, and ethics. A final point here is that the LIS can also be useful to remind us of the need to obtain patient consent to perform some procedures. There is general agreement that laboratory data is under-utilized from the point of view of scientific performance. To reverse this tendency, two objectives have been clearly identified for the LIS: (1) to improve the request of analytical services by providing knowledge about the biological properties of the laboratory quantities, and (2) to enhance the utilization of results. Two relevant factors played a key role in transforming information from data to knowledge: the huge increase in the amount of laboratory data requested, and the continuous appearance of new biological quantities. Concerning this latter point, the new analytes greatly improve and refine the clinical laboratory’s role in healthcare, but, paradoxically, complicate the interpretation of what is sometimes very complex information. Although we previously mentioned that technology today knows no boundaries, at the present time no single information system is efficient enough to simultaneously provide all these items. This is possibly because each aspect requires a different database structure. However, it is probably just a matter of time before a comprehensive solution for all three aspects is found. Meanwhile, a number of developments are growing in the clinical laboratory in the professional domain (proteomics, metabolomics), in closely-related disciplines (bioinformatics), and in the general framework of the knowledge society (knowledge globalisation). Applications that have been running for several years—such as expert systems, neural networks, and genetic algorithms—can benefit from the performance and capacity of today’s computer science and technology. It is difficult to forecast the evolution of IT and how it will continue to influence the clinical laboratory. The rather candid scepticism of 60 years ago: “I think there is a world market for maybe five computers” (Thomas Watson, chairman of IBM), has now evolved to a lawless optimism: “I do not fear computers. I fear the lack of them” (Isaac Asimov). It cannot be overlooked that the aim of information is to achieve knowledge and the aim of knowledge is to achieve wisdom. A word of caution may be advisable: “The real danger is not that computers will begin to think like men, but that men will begin to think like computers” (Sydney J. Harris). * This report is an account of the discussions held during the 2007 symposium of the ACCLC (the Catalan Association of Clinical Laboratory Sciences) on information technology in laboratory medicine. A forum was set up featuring professionals from clinical laboratories, the in vitro diagnostics industry that provides laboratory information systems, and from various health administrations. The symposium, organized in Barcelona from 1-2 March 2007, started straight off with the chairperson raising a series of questions previously developed by the advisory board and the ACCLC board. 1. Castells M, Tubella I. Projecte Internet Catalunya (PIC). Universitat Oberta de Catalunya. 2001–2007. 2. Goldschmidt HMJ. “A Review of Autovalidation Sofware in Laboratory Medicine.” Accreditation and Quality Assurance 2002;7:431–440. Josep M. Queraltó Compañó <jqueralto@santpau.es> works in the Servei de Bioquímica at the Hospital de la Santa Creu i Sant Pau in Barcelona. Maria Àngels Bosch Ferrer works in the Consorci Laboratori Intercomarcal at the Vilafranca del Penedès in Barcelona. Josep Lluís Bedini Chesa is in the Laboratori Core at the Hospital Clínic in Barcelona. Jaume Raventós Monjo is at the Consorci Hospitalari de Catalunya in Barcelona. Xavier Fuentes-Arderiu is from the Laboratory Clinic at the Hospital Universitari de Bellvitge, L’Hospitalet de Llobregat, Catalonia.